In the insurance realm, the debate of leveraging modern technology has come to a conclusion, as many tech-savvy companies in this sphere are leveraging the potential benefits of cloud. According to a recent research carried out by Deloitte, 70 percent of carriers are adopting cloud services in their business today. 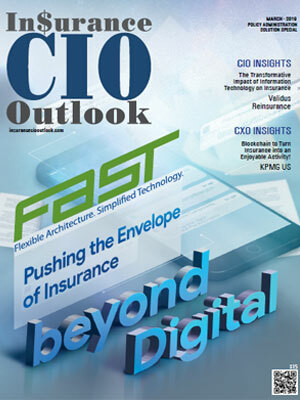 The cross-over from traditional systems to digital infrastructures has brought massive success to insurance companies that leverage the latest technologies; it encourages continuous economic growth, surging interest rates, and more customer investments. Policy administration plays a vital role at every stage of the insurance workflow from issuing the policy to final payouts. In the wake of the changes in market conduct oversight regulations nearing final adoption at insurance agencies, policy administrators are widening their focus to bring more transparency to their market, and are approaching tech solution providers to help them solve this issue. Stricter sales standards from regulatory boards in the insurance industry have led to investment products falling under the market conduct umbrella. While lawmakers in the U.S have stayed the rule giving more breathing space to those offering annuities for retirement security, there is still a lot to look forward to allowing full transparency of insurance services to the common man. Policy administration professionals are yet to fathom the new control rules in the insurance realm fully, and are now studying the enhanced IT inputs from their systems to sort and bring order in their policy issuance guidelines at insurance agencies. 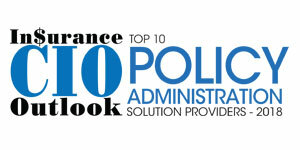 A team of highly qualified industry experts, CIOs, and CTOs along with the editorial team of Insurance CIO Outlook have assessed firms in the arena, and have shortlisted the organizations that are mitigating the challenges in the insurance industry space by a provision of solutions that bring optimum control over their policy administration issues. 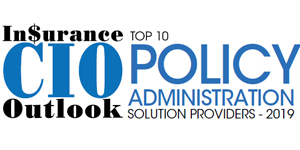 This edition of Insurance CIO Outlook comprises the “Top 10 Policy Administration Solutions Providers - 2019” featuring companies that have drastically changed the landscape of computational software in the insurance realm.